Tom's Takeover : October Playlist / Band of the Month. Following my takeover of Leanne's blog last month in which I offered up a recommended new music September playlist and Band of the Month, I thought that I would return with what I have been listening to in October. Having seen some of the comments, I hope that people will enjoy some of the suggestions below. I'm toying with the idea of creating and running my own blog using a 'one new song a day' type set up. Any feedback or further suggestions whether you think people would engage with this is greatly appreciated! Perhaps, I will get it up and running in November. New music was plentiful this month and I think I have acquired a new favourite artist with my Band of the Month. With this in mind, put your headphones in and crank the volume up as these songs are best served loud. 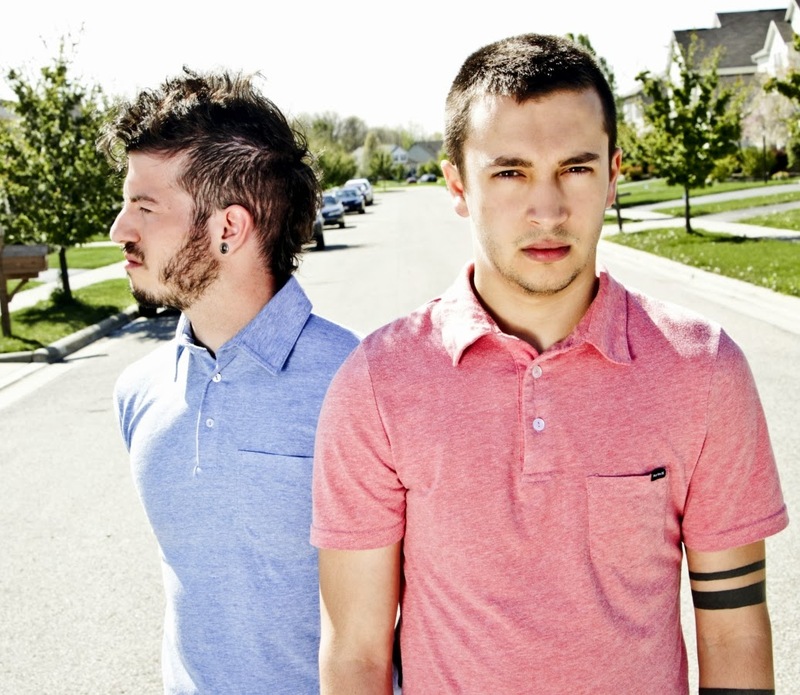 Band of the month : Twenty One Pilots. What do you get if you mix a blend of Foals, MGMT, Hellogoodbye, Flobots and Eminem? Yes, it seems a bit strange, but Twenty One Pilots have developed an alternative and diversified sound that has me hooked. Twenty One Pilots are a duo from America and are acquiring many new followers after their second full length release in 'Vessel'. The album offers a refreshing fusion of piano-driven uplifting rap-pop which will have you listening to over and over again. And if that wasn't enough, there's a ukelele and electro thrown in for good measure. You'd have never have thought this blend of genres would work, but Twenty One Pilots have served it up in impressive fashion. Stand out tracks include 'Car Radio' and 'Holding On To You' which are joy to listen to. They are touring the UK in February so make sure you get some tickets fast because we will be seeing a lot more of Twenty One Pilots in the future. I will see you there. Buy tickets to see the Twenty One Pilots here. September Playlist / Band of the month. I have a lot of handbags which are constantly on rotation. I like to switch up what I carry around with me every so often, but there are a couple of beauty bits that I stick to no matter what bag I'm carrying with me. Whatever you prefer to call them. These are a firm staple in my handbag. Whether they are neatly stored on a bit of cardboard or floating around in the depths of my handbag, I will always have a few of these to hand. They are great for a quick hair style change - my go to styles are two plaits pinned at the back, or using a couple to tame a topknot! I'm sure you will all agree that bobby pins just vanish, so its best to have at least one set in your handbag..another in you make up bag... some more on your dresser....do I need to go on? Without fail I will always have a lipbalm in my handbag. No one wants dry lips. With the weather changing, and the heating being turned back on. Now is the time that your lips may start to suffer. Therefore it's best to have one to hand at all times! Just like the bobby pins I think its best to have multiple balms scattered all over the place! I'm not germaphobic but it is nice to have anti bac in your bag. I don't often use public transport but its nice to have it just in case you do, you don't want to catch anything by grabbing the rail on the bus! I like to have the nice scented ones, so I pop over to Ebay and get myself some from Bath & Bodyworks! I always have some form of fragrance in my bag whether it be a body mist or perfume. Recently I have been mixing it up a bit and trying to use up the multiple perfume samples I have accumulated. It's great as I can try out a new scent on a daily basis. They don't take up as much room as my regular perfume bottles do. Plus I don't have to worry too much about them breaking in my bag! I always have a nail file to hand. There's nothing worse than breaking/snagging a nail and not being able to file it down or back into shape! My current nail file of choice is the StyleFile* First seen on The Apprentice thanks to Tom Pellerau, I never really though having a curved nail file would make a differece but it really does! It's great at helping you keep your nails in a good shape. You also have choice between using the rough or smoother side of the file depending on how strong your nails are. Bit of a mix this week. Not that I need another handbag but this one caught my eye and for a bargain price of £19.99 who can resist? Faux leather skirts are all over the place at the moment. I went to the Debenhams Beauty press day the other week and met with a lovely girl Ally, she had this skirt and I knew right then I needed it. I tracked it down and it will be mine! Finally I love finding little touches for our flat. I cannot wait till we own our own house so we can decorate how we want. For now I'll settle with accessories, and this Chevron print throw is on my lust list! NEED! What's caught your eye recently? I wear my glasses on a daily basis. It's rare to see me without them (I'm still trying to muster up the courage to give contact lenses a try!) so it's always nice to have a couple of pairs to choose from to mix things up a bit. I was recently sent the some frames from London Retro, which are exclusively available at MyOptique. The frames I chose were from their new Metropolitan line, and if you have a look at the different names of each style you will see that they all relate to the Underground. I chose Westminster Frames, a classic rectangular style which I knew would suit my face shape. These particular frames come in black and tortoise shell. I did debate over trying something a bit different with the tortoise frames, but opted to stick with what I knew worked well & it was a colour frame I was used to! In total there are 17 different frame styles within the Metropolitan Collection, all of which have two color options. So depending whether you want to play it safe like I have, or try something a little bit different there will be a style for you. 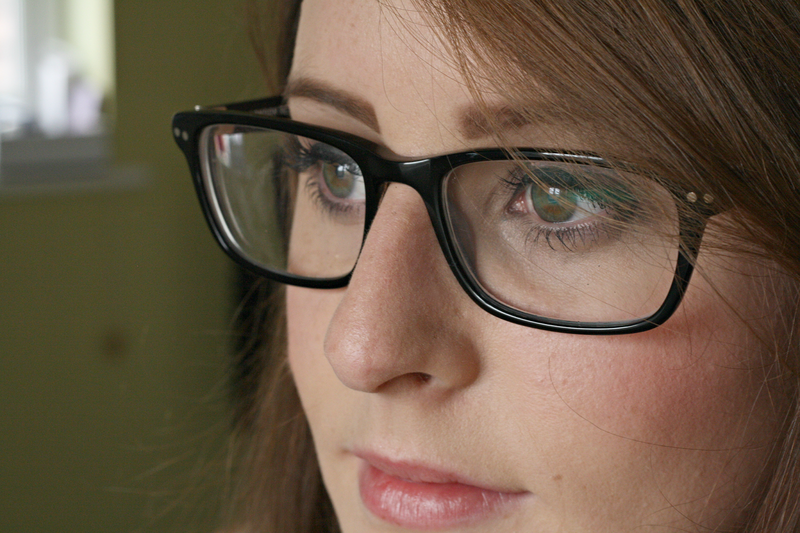 I know the particular frame wouldn't suit me at all, but I did think the cats eye glasses looked very glam! I'm still toying with the idea of trying contact lenses. I put things very close to my eyes when it comes to applying makeup, so why can't I get my head around putting some contact lenses in? Please tell me I'm not the only one that has a problem with this! But for now I'm happy to just be rocking my Retro London Westminster frames. I've got profiles on many different platforms. All of which are good places to interact with me/the blog so I thought I would put them all together in one blog post to share the various ways you can keep up to date with everything! In some cases there are some alternative way's to give feedback on my blog posts other than physically commenting on the post. I'll go through those as I come to to them! 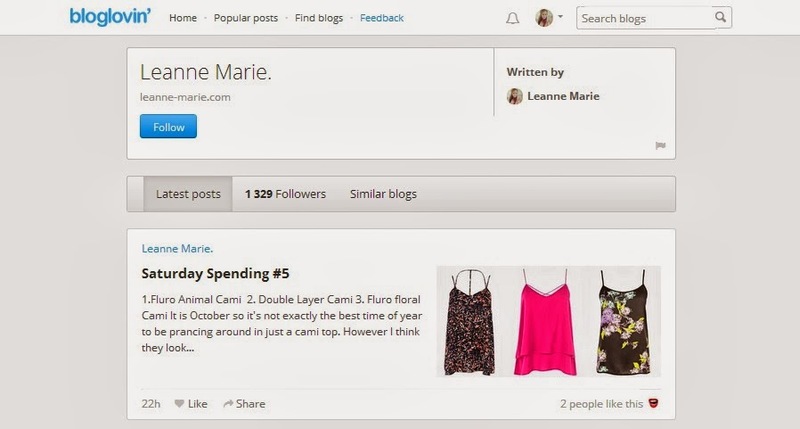 I personally use Bloglovin to follow blogs. It's also a great place to find new blogs to follow. I'm always checking out the Popular posts, and searching through the up and coming lists in all categories! The one thing I do like about Bloglovin' is how you can 'Like' a blog post. Sometimes I read posts on the go on my phone and dont have time to leave a comment. If this is the case I will 'like' the post so it shows the blog author that I enjoyed what they wrote! It's a quick and easy way to give them some feedback! I'm not sure if many people knew this was an option, so I thought I'd mention it. I use twitter for a lot of things. Interacting with friends and readers of my blog. Promoting blog links. Interacting with brands. Having a rant or sharing something I've seen online & liked. I tweet a lot. You will find me constantly checking my twitter feed. If you want a question answered quickly regarding a blog post, or anything really. Sending me a tweet will be the quickiest way to get an answer from me! Pinterest was created for all the procrastinators out there. A lot of the time I am meant to be doing something important, but instead you will find me on my phone or I Pad just pinning away! 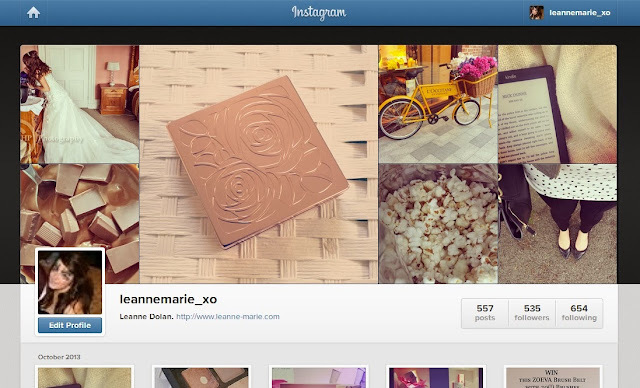 I have a selection of boards, from style inspiration, food, blog things and home decor. The possibilities are endless! Using Pinterest a good way to drive traffic to your blog, pinning images from your posts. Pinners may repin your images, and if people decide to check out the source of the image, you'll gain traffic to your blog! It's a great way to share other peoples images that you have liked on their blogs too! Share the love guys, share the love! You may have noticed at the end of my blog posts there's a little 'Pin it' button. If you've liked my post and want to share it. 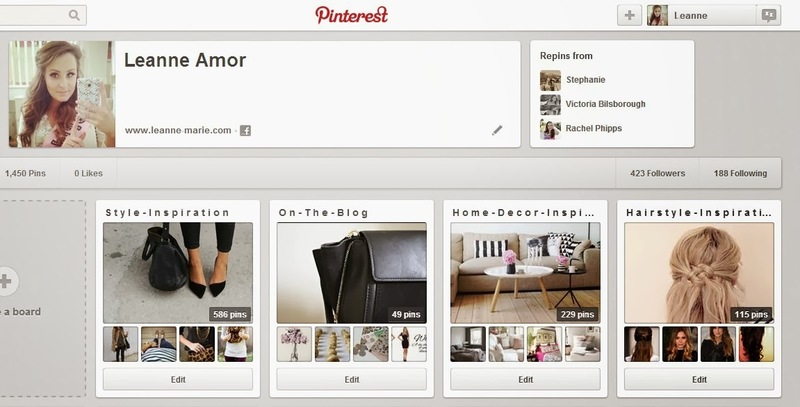 Just click that and you will be taken straight to your boards on pinterest! I wouldn't say I am an Instagram addict, and I dont use it as much as some bloggers do, however it is a nice way to share things with my blog readers, whether it be what I am up to, days out, products or items I've purchased. It's just fun to use. I love using the filters to change the way the photographs look too. #nofilter haha Thats a rare one! Rather than it just being a page of links to my blog posts, I am trying to provide different content on that platform. I share photos that dont make it onto my twitter or instagram feeds. Link to products I've found online which I am lusting after. I also share the blog posts and videos of other bloggers/vloggers I am enjoying. Basically My blogs facebook page is a little place to see some behind the scenes action of what it takes for me to 'run' my blog, and a place for me to share with everyone bits of the internet that have caught my eye! Liking images & links as well as leaving comments on the facebook page is a great way to interact with me. Whether you just want to chat or ask a question about something in particular. Maybe you have suggestions for blog posts, or there's a product you've seen in one of my photos you'd like to see a review on. 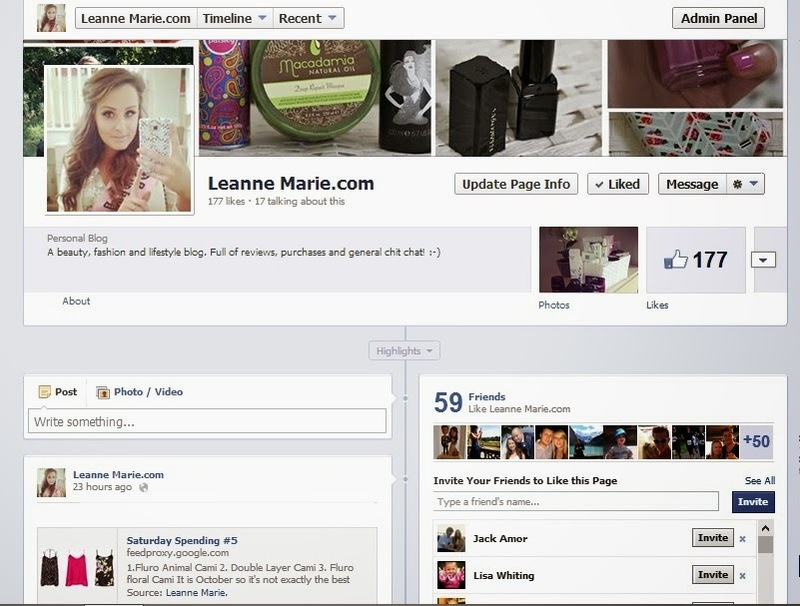 Just use the facebook wall to let me know and I can action your request! 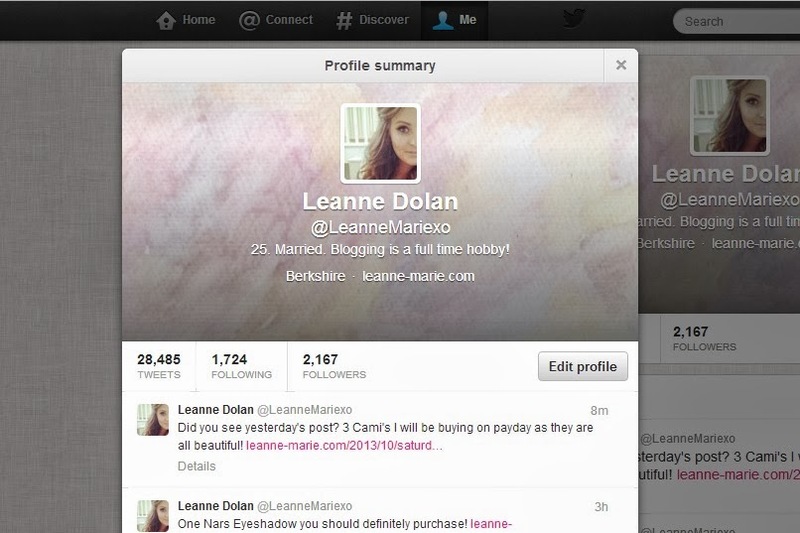 So there you have it, a couple of different ways to keep up to date with Leanne-Marie.com and also ways you can have a stalk of my life! If you have done a post similar linking the different platforms you can be found. Dont hesitate to leave it in the comments! It is October so it's not exactly the best time of year to be prancing around in just a cami top. However I think they look really nice with a pair of skinny jeans, heels and a blazer for a night out. The double layer cami is something I haven't really seen anywhere else. It would look fab paired with black items to really make the bright pink stand out even more! 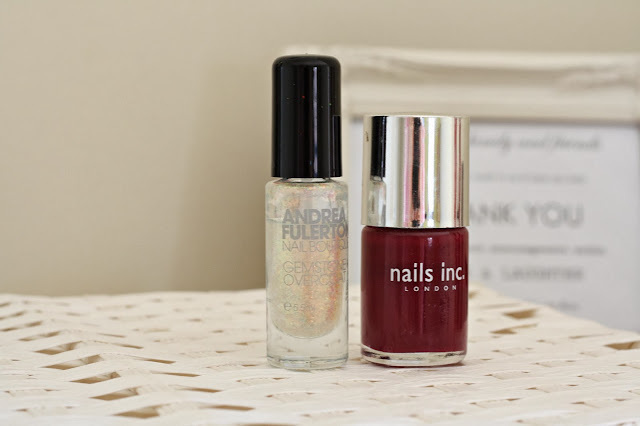 I haven't put up an empties blog post in a while. I got out of the habit of 'collecting' my finished products so just chucked them away when I finished them! I thought I'd get back into the swing of things as it means I can keep track of the products I am using up. So here are my recent empty products. If I wasnt so forgetful the shampoo to accompany this conditioner would be here too, but after leaving it at my parents house, it was swiftly used by my sister so I was unable to try it properly! Thankfully I still had the conditioner to finish. This treatment is specifically for dry and damaged hair, something that I do have! There's no scent to it, which I found a bit odd - I love nice smelling hair products. In order to moisturise and help detangle the product incluse collegen and Vitamin E. My hair did feel really soft and managable after using it but not as amazing as I would have liked. Don't get me wrong, it says what it does on the tin, but I've used other products that I feel do a better job. Now this is a combo which I will be purchasing with my own money in the near future. If you'd like to know more on what I thought on the range then you can read my review here. Another haircare favourite of mine which I will probably buy myself in the near feature. It never fails to leave my hair feeling amazing and soft. I'd quite like to try some of the other products Macadamia Oil have in their range. If they are as good as this masque then i'll be sure to like them! This was the first Miscellar water I tried, and I really emjoyed it. It's a complete bargain at only £6.50 and lasted me a fairly long time. I found it removed my eyemakeup really well. Just popped some onto a cotton pad and held it onto my eye for a few seconds, then swiped away. It probably took 2 swipes in order to remove all my eye makeup. I was really impressed! I'm currently trying the Loreal Miscellar water, but I think I prefered this one! I'll probably end up buying it when the Loreal one runs out as I prefer it. One of my favourite Batiste scents. I go through so many cans of these, I've nearly finished my paisley one featured in my current favourites post. I think I need to get myself down to boots and stock up on some more cans! Clearly I was on a bit of a roll with using up haircare items. This could be because they were taking over the shower a little bit! :-) I've put a few products aside that I want to finish up soon as they are nearly empty so there might not be such a big gap between the empty posts in the future! If you want to dip your toe into the Nars pool, the one thing I suggest you purchase is their eyeshadow in 'Nepal'. As you can see from the above photograph, it's a well loved eyeshadow of mine. Nepal eyeshadow is one of those products that's a bit deceiving, it looks darker in the pan to when it's applied. It is a beautiful warm pinky bronze/gold shimmer, a perfect everyday shadow for just that hint of colour. I usually apply it dry, however if you wanted a more intense colour your could apply it wet. 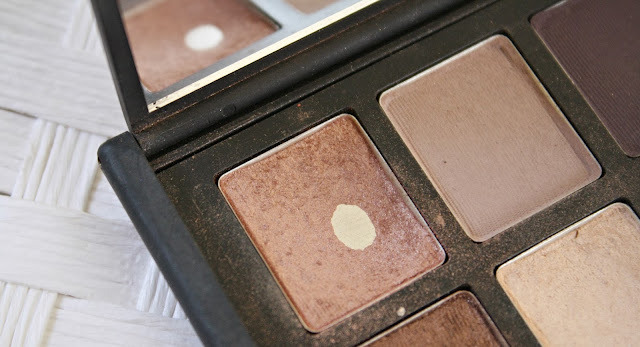 Most of Nars Eyeshadows are so buttery soft, it makes them so easy to use when blending. Nepal looks beautiful applied on it's own as it is pretty subtle for day to day use, but for a little bit of a brown smokey eye I sometimes use Nars Fez eyeshadow in the outer corners and crease for a bit more drama. I have Nepal in my Pleasures of Paris palette, you cannot get this particular palette anymore (unless youre lucky enough to see it pop up in a blog sale!) But never fear, you can buy Nepal in single shadow form for £18. You may think £18 is a lot for an eyeshadow, but this really is such a lovely shade that when I completely hit pan on the one in my palette I will be picking it up in single shadow form! You can purchase the Nars Eyeshadow in Nepal here. Have you tried Nepal before? Do you have a favourite go-to eyeshadow? Let me know in the comments. 1. 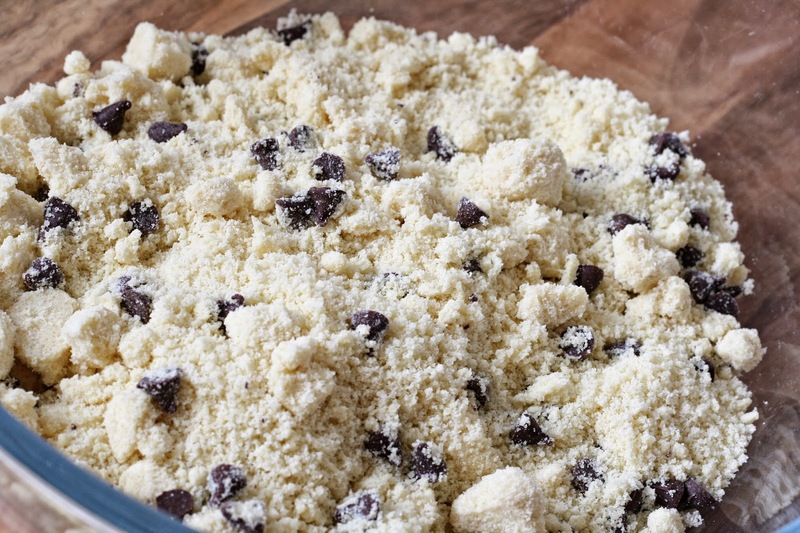 Mix your cookie dough. The only thing I needed to do to this premade mix was add 2 tablespoons of water. 2. 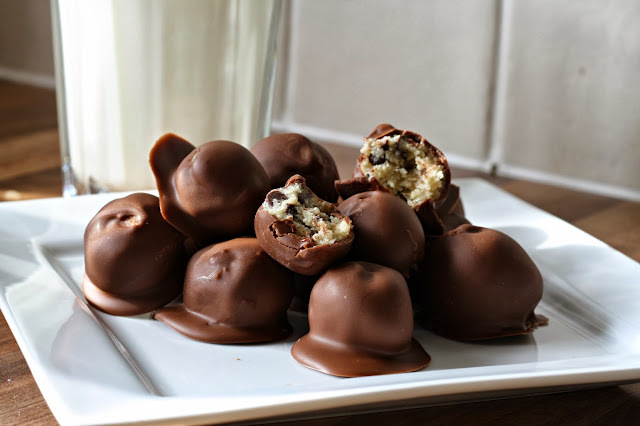 Once mixed take a small amount of the mix, roll into a small ball using your hands. Continue to do this until you have used all the mix from your bowl. 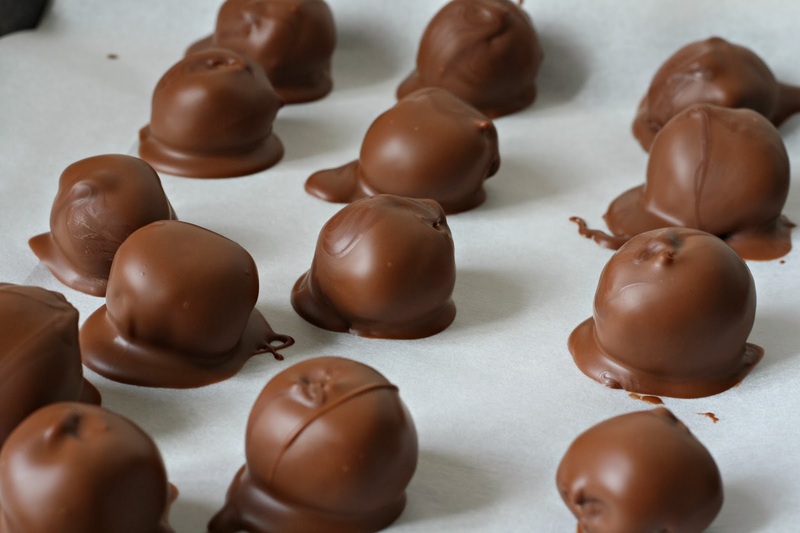 Place the balls on a tray covered in baking paper. 3. 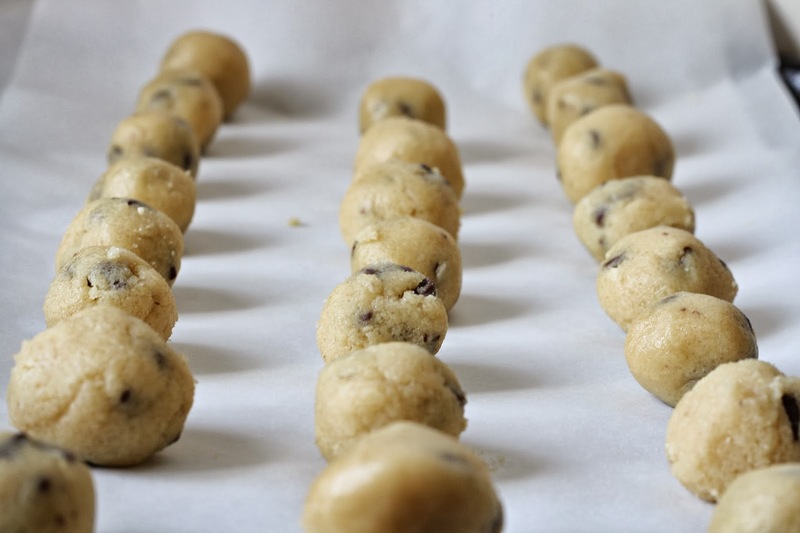 Put the tray into your fridge for 30 mins in order for the dough to harden slightly. 4. Take your chocolate and melt it. - Like before I use the method of putting it into a bowl over a saucepan of simmering water. 6. To set, pop the tray back into the fridge until they harden. 7. Once set, EAT THEM ALL! Food : Rocky Road / Fridge Cake recipe. I go through phases with exercise. Sometimes I'm on it like a boss, doing the blogilates calendar, going to the gym (if I have a membership at the time) and making an effort to 'power walk' to and from work, and other times I'm just lazy and do nothing at all! I am one of these people that gets a bit paranoid when I do exercise. I worry way too much about what others think of me. It's one of my bad traits. I worry far too much. That being said, and as materialistic as it sounds, if I'm wearing something I like, I get a little confidence boost. I recently joined a new gym. One that is around the corner from me so I have no excuses! It's always a little daunting walking into that sort of environment. With all the fitness enthusiasts decked out in the latest fitness gear, and little old me strolling in. Now I don't like to draw too much attention to myself when I'm in the gym, so the neon crop and vest tops are pushed to the side, however I dont mind a splash of neon here or there! You may remember I bought some bright pink Nike trainers from their outlet store in Swindon earlier on in the year. Well I have a new addition now and they are the Nike Flex speed running trainers* These beat my bright pink ones, hands down in the comfort stakes. They are so comfortable and light, I really don't feel like I am wearing any trainers at all! It's such a bizarre sensation. If I'm feeling particularly 'on it' I also throw on my zaggora vivas and hot top. These are in a bright blue shade so I do actually wear another pair of black leggings over the top to cover them (if you have followed me for a while you will know about the er...sweat issue with having zaggoras in a light colour!) 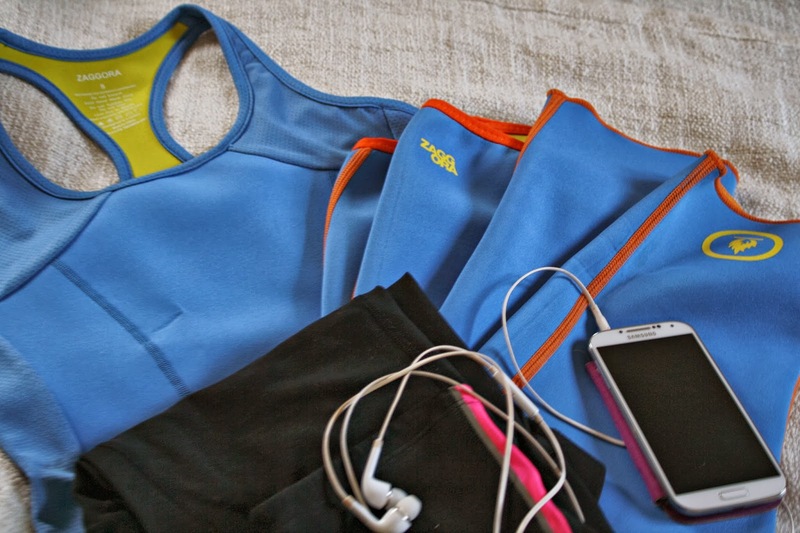 When I'm all kitted out like this, I feel a little more confident and ready for a good workout at the gym/blogilates session! I actually look like I should belong on the gym and not as out of place! My Current playlist for the gym is actually just an album I downloaded from spotify. The Workout Mix 2013. I sometimes create my own playlists, but recently I just haven't had time to sit down and put one together! I always listen to fast paced, dance style music when working out. I feel it makes me work harder! 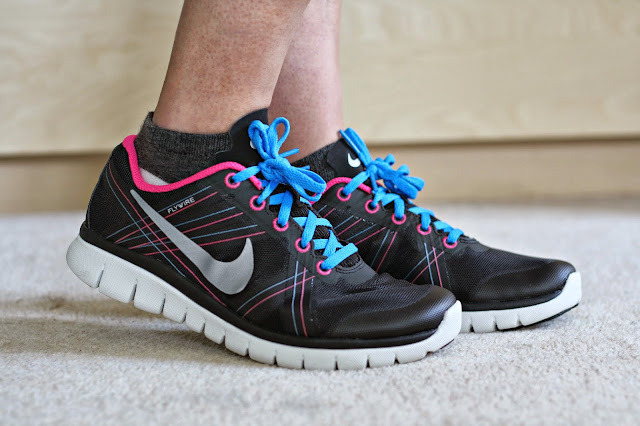 What do you wear to workout, are you like me and need that little boost of confidence when heading into a gym? Uh oh I tripped and fell into the makeup stand in Topshop. I wasn't planning on purchasing anything but you know how it is, you start swatching on the back of your hand, and the next thing you know you're paying at the till. The other week I bought myself the Topshop Lipstick in Beehive. Another pink lipstick to add to my collection! I had first heard about this new shade from Topshop thanks to Jennie's blog after she mentioned it in one of her wishlist posts. I think I actually commented on her post saying I needed the lipstick in my life. 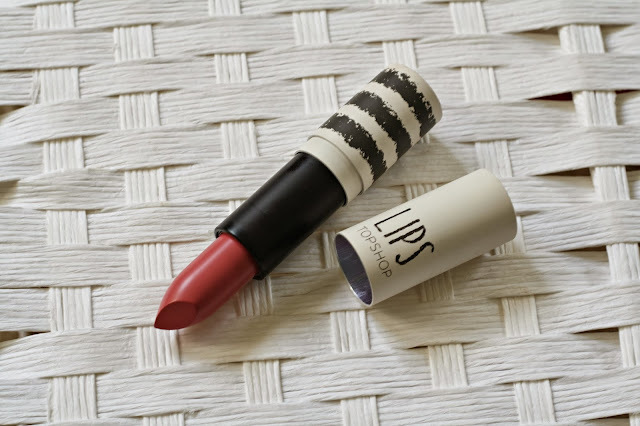 Just like many other lipsticks from Topshop, this one will be a firm favourite. It's a beautiful soft pink, I would describe it as a 'my lips but better' lipstick. It looks a lot darker in the bullet than how it comes out so dont let that put you off. This is a perfect everyday shade for me. It's really moisturising and has a finish similar to Mac Lustre lipsticks. It applies really smoothly. It's one of those lipsticks I can easily apply without a mirror - Which is good for me seeing as I seem to always misplace my mirror in my handbag! I do think it is a shade that would suit everyone. For only £8 it is love. I did purchase another lipstick from the Topshop range which I may blog about at a later date, I'm currently a bit undecided if it even suits me. Hate it when that happens as - for obvious reasons - you cant return makeup items! Have you tried Beehive by Topshop, or maybe there are some other shades you prefer. Let me know in the comments! Just a couple of items I've had my eye on this week. 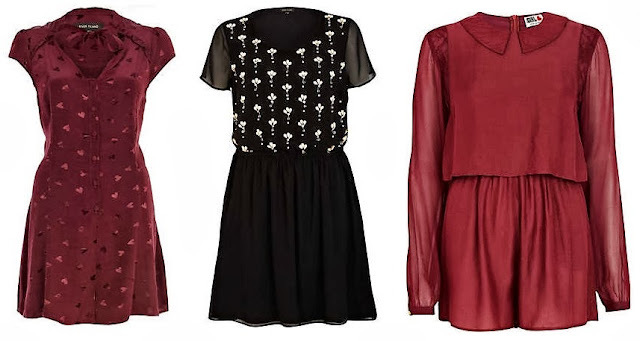 I love the embellished skater dress. Even better that it's in the sale too! When Autumn rolls around I'm always drawn towards the maroon colours! It's October, now we can officially say it's autumn! Wayhey! I do like autumn, it's that inbetween stage, where summer has officially left us, but Christmas is just around the corner. Yes I'm excited about Christmas already! It's always the time when I re evaluate my wardrobe, dig out the jumpers, put away the summer shorts and buy a few new things to add in! It seems a bit of a thing for me to purchase a new coat each A/W I cant help myself. I have my coats from the past 2 years in my wardrobe that would be perfectly fine to use for another season, but I just cant help myself. I don't own a black coat, so I was on the hunt for one. A lot of people were talking about how Primark had come up with some brilliant coats this season so I decided to pop along and have a look. After trying on various different styles (and coming to the conclusion that wearing a parka just makes me look like I've got a sleeping bag wrapped around me) I opted for this fitted biker style one. Biker style coats seem to be the 'in' thing at the moment, they are everywhere. The main reason I was drawn to this particular one was the cut. It's a very flattering fitted shape, and I just love how it goes out like a skirt at the bottom. For £25 I couldn't leave it on the shelf! It had to be mine! Another item I always buy each A/W are new scarves and gloves. Every year I manage to loose my gloves in some way or another - I'm actually yet to purchase some new ones to keep my hands warm on my walk to work, however I have got myself a fancy new scarf. Usually I hop along to primark and pick up a snood of some sorts, however this year I wanted to be different. To treat myself. So that is why I went to accessorize and got myself the "Suzie Scarf". 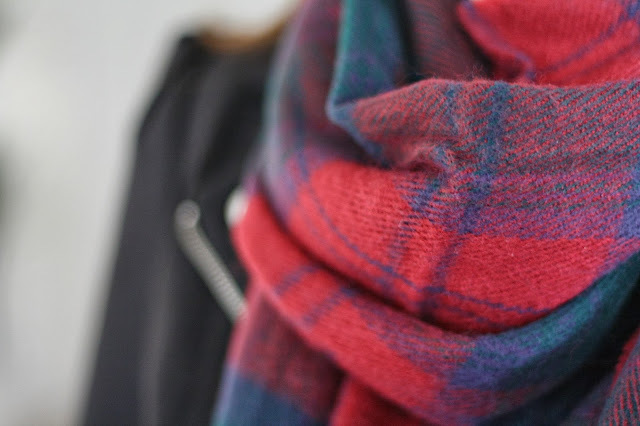 I've been wanting to embrace the tartan trend somehow, and I felt this was the most appropriate way to do it without being too 'in your face'. It's so warm and snuggly. I do want it to get a little colder so I can justify wearing it out! Finally, an item that will divide people I'm sure... 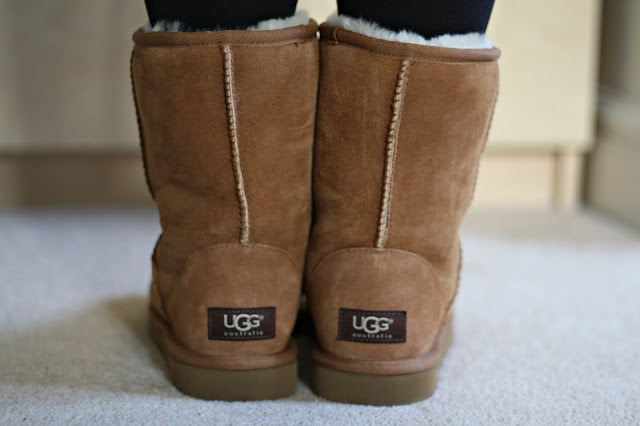 The Classic Chestnut short UGG boot* Now I've never owned a pair of (real) UGG's before. I've always opted for the slightly cheaper brands (but not as cheap as Primarks own!) because I never thought they would be worth the price they are. However wearing these in comparison to the pairs I've had before, it's no wonder these are so popular. The quality does effect the price, and I understand why people pay the price they do for the brand. They are SO comfortable, my feet are so snug and I know by the time it gets really cold I wont need to be doubling up my socks to keep my feet warm! Obviously not everyone likes this particular style, which is why UGG Australia have brought out other styles of boots and shoes. Some of which I don't think you would even know they were UGG unless you looked really closely! My particular favourites are the Esplanade boots and the Alloway Exotic flats in Cheetah! It's not often that I treat my face to a pamper. I mean, yes I give my hair some TLC and my body, but I always forget my face. That's bad isn't it! Recently I've been trying to make more of an effort in that department. Ensuring I take my makeup off before bed (I wont lie, I'm partial to nights sleep with my makeup on! ), Cleansing, toning and moisturising properly and of course dipping my toe into the face mask world. I was recently sent the YonKa Gommage 303 Exfoliating Clarifying gel* which you can use as a mask. Yonka is a luxury french skincare brand that stock cleansers, moisturisers, masks and more. 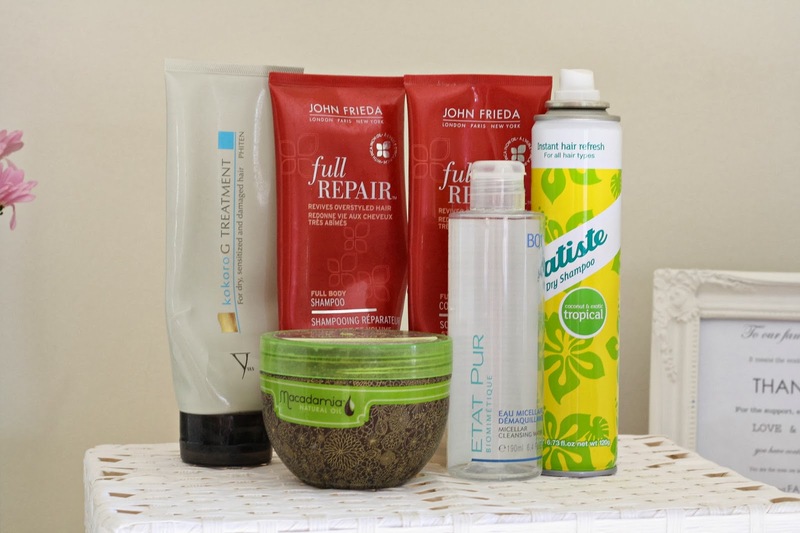 All your generic skincare staples plus a few treatment products for the face and body. I currently use the Gommage 303 twice a week, it's basically a non abrasive exfoliating mask, by using it you will remove dead skin cells and smooth your skin . It claims that over time and with continued use your complexion will improve and become more radiant. Well I liked the sound of that! To use I simply cleanse my face as normal, then using a small amount of product, i create a thin 'mask' all over my face using the Gommage 303. I leave this to 'set' for a few minutes. I usually check my phone or watch a youtube video while it does this. While it sets you can feel your face tighten slightly. A bit like when you use those peel off face masks. There is a scent to the product, however I don't find it too over powering personally, I actually quite like it! I've seen other reviews stating otherwise, but it must be to each individuals tastes! Once it has set or dried, to remove the mask I use a muslin cloth soaked in warm water. You can just wash it off using water but I prefer to use a cloth as I feel I can really ensure all the product is removed that way. Once removed my skin feels a lot fresher and smooth. Over the past coupe of weeks I have seen an improvement in my complexion, I'm not glowing with radiance, however when I'm without makeup my skin doesn't look as dull as it used to. This exfoliating clarifying gel would be perfect to use in the A/W months as I feel that is when our skin looses a bit of it's spark and can look a bit drab. It's the perfect pick me up to add into your skincare routine one or two times a week! In regards to price it is a bit steep at £32 depending on what you're used to paying for skincare. Would I say the price is worth it? I'm a bit undecided at the moment. I do like it, however I haven't really tried any other exfoliating masks to compare it with. There may be others on the market that do a similar job for a lower price. I will say though, it has improved the look of my skin and the 50ml bottle has lasted me a decent amount of time, so cost per use is justifiable! Have you tried anything from YonKa Paris before? Can you suggest any face masks I should try?